The hippocampus is believed to participate in the control of the ventral striatal loop (or limbic loop) belonging to the limbic system (Groenewegen et al. 1991;Witter and Groennewegen 1992; Maclean 1992). The ventral striatal loop (Fig. 20) is organized like the well-known dorsal striatal loop, but involves different structures. 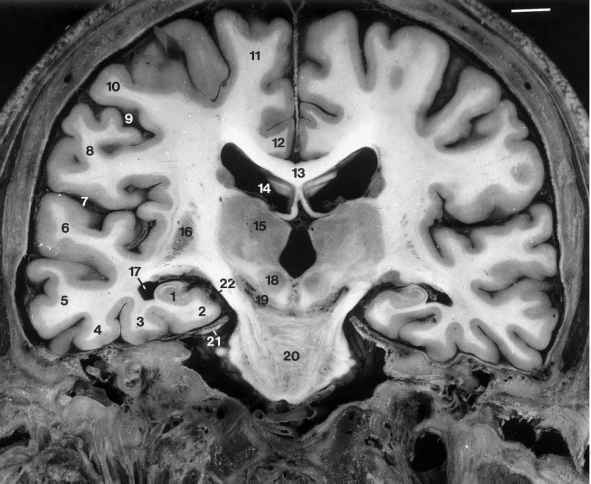 The main center of this loop is the ventral striatum or nucleus accumbens (Fig. 20A), which receives projections from the prefrontal cortex and controls the ventral pallidum. The ventral pallidum, which is of ill-defined location in humans (Fig. 20B), projects to the dorsomedial tha-lamic nucleus, although this projection is controversial in primates (Haber et al. 1993). From the dorso-medial nucleus, fibers return to the prefrontal cortex. The ventral striatum (nucleus accumbens) is itself controlled by dopaminergic fibers arising from the ventral tegmental area (cell group A10) and belonging to the dopaminergic mesolimbic system, as well as by the amygdala and the hippocampus. Fibers from the hippocampus reach the ventral stria-tum by way of the precommissural fornix (Lavin and Grace 1994). The ventral striatal loop may play a role in the control of motor behavior (e.g., motor reactions to emotion) and are thought to be involved in the mechanisms of drug addiction (Williams 1995).